If you have a group of at least 40 people who have already expressed interest and are basically at the ready to sign up if you do a retreat. The above guideline is to try and guarantee at least 10 to 15 people setting aside a weekend in advance and paying you hundreds of dollars to come and have a new experience! I suggest looking for places that are about the size for a group of 10 – 15 to start. 3) Start promoting 6 months ahead of time with fliers, emails and social media. Give people an incentive to sign up early and also have an initial deposit that is non refundable (but maybe transferable to future retreats) of between 20 and 30% of the full price. 4) For a first retreat I recommend doing just a weekend —Friday night through Sunday afternoon. 5) Research the details —per night rental price, do you need to bring and pay for your own caterer etc and start off at a price where you are making between $100 to $150 per person on top of your costs. 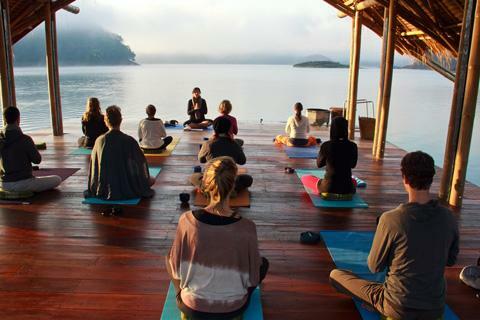 Depending on the community you serve you will eventually be able to raise those prices, increase your profit, and to do 3-night retreats at larger and prettier/nicer retreat centers. Initially, keeping your pricing at around $550 or lower seems like a good place to start, unless your community is in a wealthy area and can afford starting higher right off the bat. 6) Know that you will most likely have to pay at least a $1000 deposit to reserve the center, perhaps even $1500 to $2000 and they most likely will have a minimum overall price to pay even if you don’t get enough people to cover this cost…. So PLAN carefully, promote way in advance and start off small —you can always grow! 7) Earlier on in this whole process, you really want to dream up your retreat format and name/description…. What makes it unique, why should people want to come, what is your community interested in, how do you position what you are doing to draw in as many people as you can AND so that it is an expression of something authentic to you that you can deliver well? If you can have 15 people participate, if you can deliver a great retreat that you feel good about in terms of the experience, and if you walk away with between $1500 and $2000 in profit —you have succeeded wildly and are laying the foundation for a regular event that can grow! Please let me know any additional questions or comments you may have on this post below!